Items with a * beside are favourites. My sister found this t-shirt seller on Etsy, and she has some awesome t-shirts. She also happens to be from Belfast! So yay, supporting local small businesses etc. All the t-shirts I asked are from her store. You may or may not know this about me, but I am a massive kid. Shopping for toys is my second favourite shopping after shopping for my pets. So naturally that is reflected in my Christmas list. See, told you things hadn't changed much from Christmases when I was younger. *Anna From Frozen Animator Doll This line of Disney dolls is one of my favourites ever. They are just beautiful, and at £20 such a bargain. I already have Kristoff, so I wanted Anna to go along with him. I'd really love Elsa too, but they've been sold out of her for ages! I also have Pocahontas and Rapunzel. *Sleek MakeUp i-Divine Eyeshadow Palette- Original I already have two of these palettes and they are by far my favourite. Great colour and over all quality. I'd really recommend them. I love the teal colours in this particular palette. Would be great if I wanted to do my make up Giants' themed! If Santa doesn't buy me it, I might have to treat myself. OBSESSIVE COMPULSIVE COSMETICS Lip tar I seen a review on these years ago and I've always wanted to try them. I figured I'd ask for a colour different to the lipsticks and such I already have and asked for either Annika or Hush. I'm not asking for any regular books as I read almost everything on my Kindle. They books I did ask for are all art or journal related. I love these kinds of books. They really give me inspiration when my creative juices are lacking. *The Imaginary World of by Keri Smith I'm a BIG fan of Keri Smith's books. I'll have to do a post about my Wreck This Journal soon. I have a couple of her books I haven't started yet, but I still couldn't resist popping this on my list. If you enjoy being creative, I'd really recommend checking her books out. *Q and A a Day: 5-Year Journal I love having things to look back on, and I thought this twist on a journal was awesome. The Happiness Project One-Sentence Journal: A Five-year Record Again, this is a similar idea. They're slightly different, so I couldn't decide which to put on my list. I'd really like to get both at some stage. And lastly, these are just some random ideas I figured I'd lump together. *Pittsburgh Penguins 2015 Calendar I really wanted something Penguins related but it was all quite expensive. So I decided to put this down. I think I'll treat myself possibly a jersey around my Birthday. *Acrylic Paint - Special Offer Multi Pack I want to get back into doing my art and crafts in the new year, so I figured I'd ask for some new paints. Beverly Hills Chihuahua 1-3 After Gracie passed away Eva and I watched these with our boys Edwin and Berty. Watching them react to the Chihuahuas on the screen really cheered us up. Chihuahua-Opoly I usually ask for a board game for Christmas, and thought this one had great novelty value. I forgot to put this item on the collage, but every year we ask for one main present. It's usually what we want most and a little more expensive than the other things we've asked for. 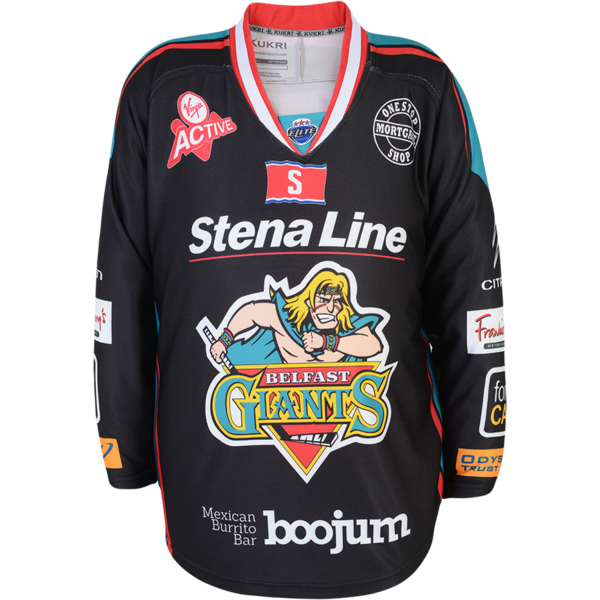 This year I've asked for a black Belfast Giants jersey. And I'm pretty sure I'm getting it because I overheard my mum place the order! Despite already having a white and a teal one, I am super excited. I'm having this one customised too with SARABLOO and the number 84 on the back. And that brings us to the end of my incredibly long winded Christmas wish ideas list. Like I said, I imagine I'll get maybe a couple of things of it. Santa just likes to have as much help as possible. I swear I'm not a greedy guts! 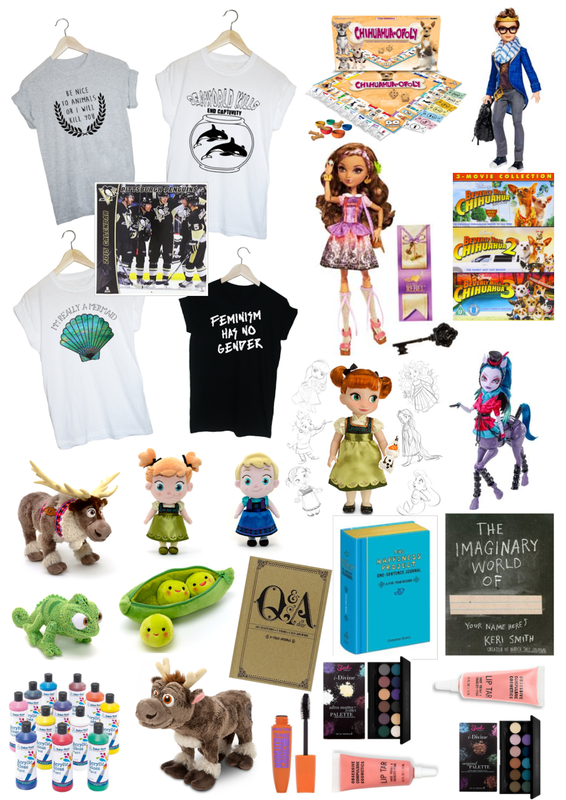 If you've made a Christmas Wish List blog post I'd love if you'd link it in the comments below. I'd like to check them out! LOVE THIS and wish I had seen it before I did mine haha. I love all of the Tshirts, especially the Seaworld (crueltyworld more like) one and the mermaid one! Can you tell I'm a lover of the ocean?! Haha, I'm starting to get excited now, only one month to go!